Backyard Ponds, waterfalls, water gardens, pondless & disappearing waterfalls, fountains and assorted water features are the latest trend in landscaping as more and more people realize the enjoyment and serenity water adds to their hectic lives. 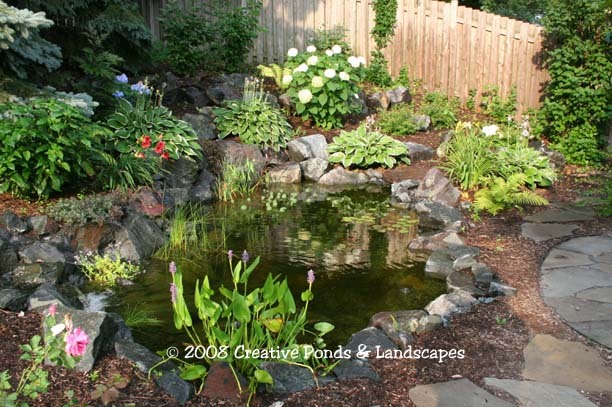 Talk to any pond or pondless waterfall owner in the Twin Cities of Minneapolis & St. Paul, MN. and they will likely tell you adding a pond & waterfall or other water feature was the best investment they have made. What better way to unwind from a busy day. Sit back and enjoy the soothing sound of a cascading waterfall, the colorful & friendly fish as they greet you, and the abundance of birds and wildlife drawn to your own back yard paradise. Unfortunately all ponds & waterfalls are not created equal. With so many landscape contractors in Minneapolis & St. Paul, MN. to choose from why choose Creative Ponds & Landscapes? Well, contrary to what some people may think or lead you to believe the construction of a properly operating water feature is indeed a "specialty" service and should not be treated as just one of many landscape services offered. Backyard ponds, waterfalls, water gardens, pondless waterfalls, and fountains are the main focus of our company with our landscape services used to enhance the newly installed water feature or other areas of your landscape as needed or desired. Are You Considering Getting Your Feet Wet? It is said “Anything worth doing is worth doing right.” Proper planning will ensure success and provide the maximum enjoyment your water feature has to offer. Do you reside in the Twin Cities of Minneapolis & St. Paul MN. or surrounding area? Click Here to Contact Us about an on-site design consultation. Do you have an existing pond or waterfall? Looking for pond, fish & aquatic plant care information? Click Here for our extensive Pond Care section. Retrofit, Repair & Enhancement Services: Is your existing pond or waterfall old, lack filtration or becoming a maintenance nightmare? Maybe a facelift is needed? Creative Ponds & Landscapes offers pond & waterfall maintenance, repair, retrofit & enhancement services in the Twin Cities of Minneapolis & St. Paul, MN and surrounding area Click here to view an assortment of projects that have benefited from this service.